This show was broadcast on December 2, 2013. In this interview, Alan warns that the Zionists may pull another 9/11-style false flag as a pretext for attacking Iran or launching a final ethnic cleansing of Palestine. 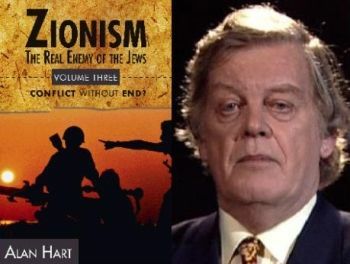 A former BBC lead Mideast corresponded and back-channel negotiator, Alan Hart is the author of Zionism: The Real Enemy of the Jews, the best introduction to the conflict in occupied Palestine. This entry was posted on Saturday, November 30th, 2013 at 7:24 pm	and is filed under 9/11, Anti-War, Censorship-Propaganda, Death Squads, Disaster Capitalism, Econo, False Flag/Fake Terror, Freedom, Justice, Kevin Barrett, News, Occupation, Protest, War Crimes. You can follow any responses to this entry through the RSS 2.0 feed.